A loud weekend. Niece, nephew, puppy and parents in the house. After a week with just the two of us, Rosie and I are wondering where our tranquil oasis has gone! I have never seen this kind of onion before. According to wikipedia, it is widely used in asian cuisine. Other than that I really have no other informations, sorry! But let us know if you learn anything else. Is that what i think it is? Back in Nepal, we used to have green garlic.You can’t fine them here in the US. Are the green stems flat? Some of them look flat in the picture and some don’t. Rose – If I find out anything more I’ll write about it! Zarah Maria – Welcome! And thanks for all the info. Assume you included weblinks but they haven’t published for some reason. Thanks anyway! Mainyacha – Will check the stems next time I’m at my parents. Need to do a taste test too! 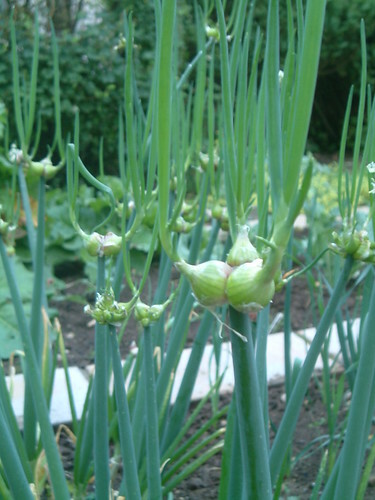 Onions and stems. – the other was just a google search for “egyptian onion recipes”, as I said earlier. 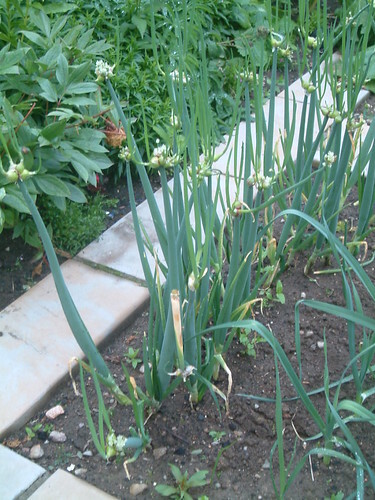 It looks like a mutant spring(green) onions! How coool! Zarahmarie – Thanks for the link! Annemarie – Oh dear. Now Im REALLY confused. It’s very interesting that you too are trying to figure out what these are! I have them growing in my yard and have been trying desperately to find out what it is!! Magic Cochin – Thank you! Will definitely check this out! C – Welcome! Glad I’m not the only stumped one!